Want to win exclusive items and tickets for the upcoming ESGS Philippines 2015 this October 24 and 25 at SMX Mall Of Asia? ESGS is the largest gaming convention happen yearly. To know more about ESGS 2015 click here. MSI Philippines together with ESGS will raffling some goodies and tickets. 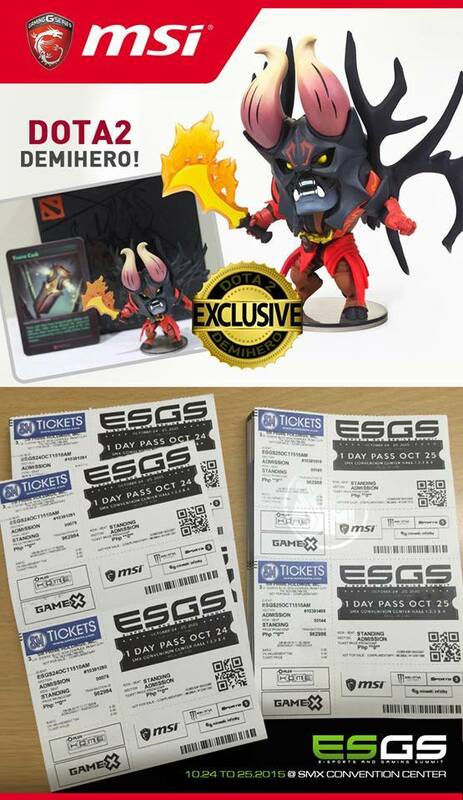 Win a DOTA 2 Doom Demi-Hero and a total of 40 tickets for the ESGS 2015. Step 2: Introduce your friends to this giveaway by SHARING this to your wall and TELL us “WHY you want to WIN?” add #MSIESGSGiveaway at the end. Step 3: Register your Entry HERE.